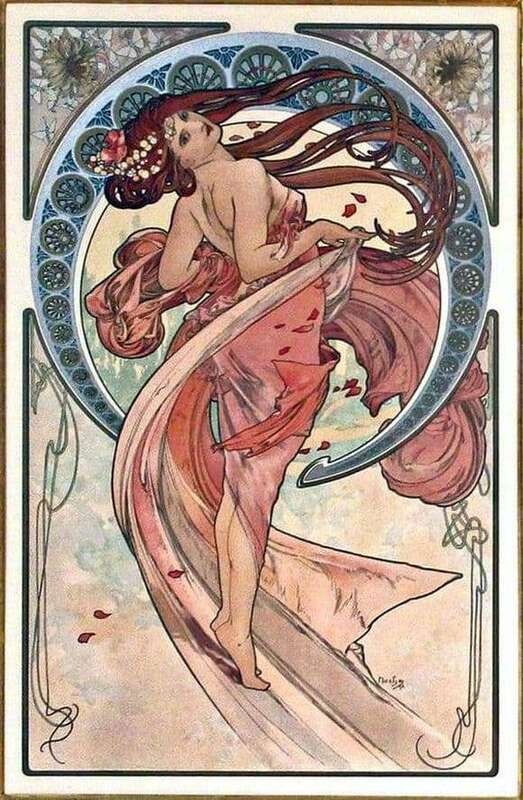 The painting “Dance” by Czech artist Alphonse Mucha is a pearl of world heritage. Cloth refers to the styles of modern and art nouveau. From under the artist’s brush masterpiece was released in 1897. “Dance” reminds an illustration to a wonderful fairy tale or a beautiful poem. The foreground is saturated with many details contrasting with each other. The central character of the canvas is a girl. Her image is replete with elements of the ornament, which allows her not to get lost among such dominant details. We can say that this masterpiece refers to lithography. Not without reason, Alphonse was famous for his talent to draw and design posters. In his work, he often resorted to stencils and special paints. That is why his works were so bright and original. “Dance” is a work full of movement, femininity and flight. The heroine of the picture is dynamic in its immobility. Her red hair, the hem of a light dress, the drape behind, everything is in dance. The girl in the picture can hardly be called thin. She has pleasant rounded shapes that do not interfere with her beautiful movement. The work is framed in a frame imitating a thin cord. This decision gives it extra lightness and harmony. Bright, shocking, young lady wonderfully combined with such a fuzzy background color. Nothing is known about the girl herself. Perhaps this hot lady has a noble origin. The red-haired beast can be a simple poor young lady. It is known for certain that she is beautiful and knows it herself.